When it’s freezing outside, there is no better time to heat things up in the kitchen and try new recipes while pouring yourself a glass (or multiples) of wine to enjoy with each dish. If by chance you are not a master chef, we have some food/spice suggestions that pair well with our Signature and Black Label Folino Estate wines to get you started. Whether you’re looking for quick meals to make on busy weeknights, or a romantic dinner for a quiet night at home, our pairings will lead you to the perfect recipe suggestions for you to enjoy while sipping your favorite wine! Winter is red wine season, and there is no better way to enjoy the fresh flavor of rosemary than with the hearty tannins of Cab Sav to counteract. We suggest treating yourself to juicy steaks of your choosing (and braving the cold to grill makes them THAT much better) and whipping up fresh rosemary butter to top it off. Enhance your hearty winter meal with rosemary potatoes as a side. A satisfying and rich meal, coming right up! Pinot Noir is an excellent table wine and is recommended for drinking with almost any winter dish. So, why mushrooms? The lush, smooth finish of Pinot Noir greatly enhances the earthy and meaty flavors of the mushrooms leaving a light flavorful mouthfeel when paired together. We suggest a creamy mushroom pasta dish, or perhaps split your wine for drinking and cooking and make a delectable red wine mushroom sauce? For those still dreaming of summer and can’t quite settle in to the winter red wine trend, we have the perfect white wine pairing for you. Our Viognier, a rich and creamy semi-dry white finds its place among the “winter wines” by pairing exceptionally well with caramelized, roasted, or sauteed root vegetables such as potatoes, turnips, celery, and radishes. The earthy flavors and simple textures of the vegetables paired with the richness of the Viognier are further enhanced by the cooking style of the vegetables. Try sheet-pan roasted root vegetables (perfect for meal prepping), or honey glazed root vegetables with your favorite poultry or pork dish. Do you have a sweet tooth? No worries, us too. Moscato, sweet and fruity that boasts aromas of sweet spice, pairs perfectly with a fresh, locally grown squash with nutty flavors. Our favorite way to enjoy butternut squash during the harsh winter months? Butternut Squash Soup. Y U M ! Our new, rich and sweet Aperitif style wine is the ideal Black Label wine to enjoy with one of our simple dessert favorites: chocolate. Whether you’re making a delectable chocolate cake, sharing a box of decadent chocolates by the fire with your loved one, or enjoying the cold (indoors) with chocolate gelato, the bold and smoky characteristics of L’Amore di Lidia will comfortably balance your pairing. One of our favorite ways to warm up and beat the winter blues is with a Soup and Wine Tasting! Join us for our soup and wine tasting event January 26th and 27th all day in our Tasting Room for 3 homemade soups paired with 3 signature Folino Estate wines. Check out our thoughtfully prepared pairings waiting for you! For reservations, please call 484-452-3633 ext 2. 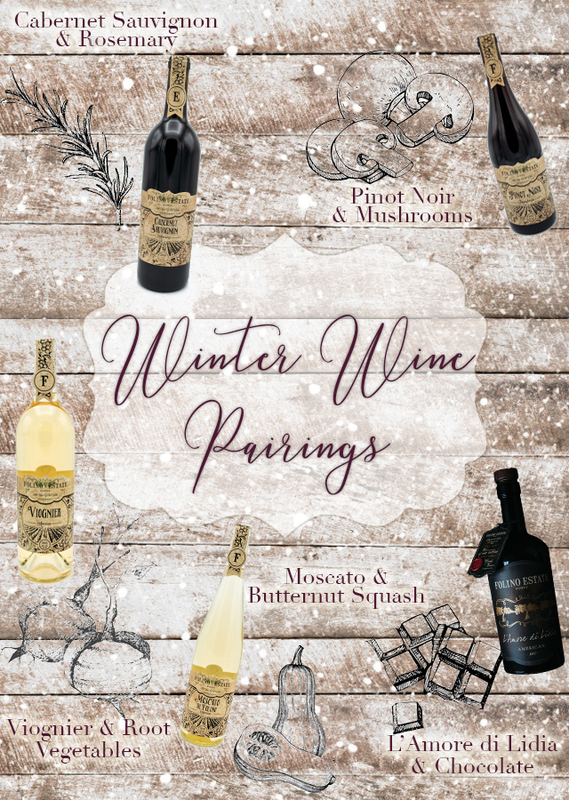 Folino Estate Wine Pairings… All Year Long! Folino Estate offers a different wine pairing every month throughout the year that changes depending on the seasons and holidays. 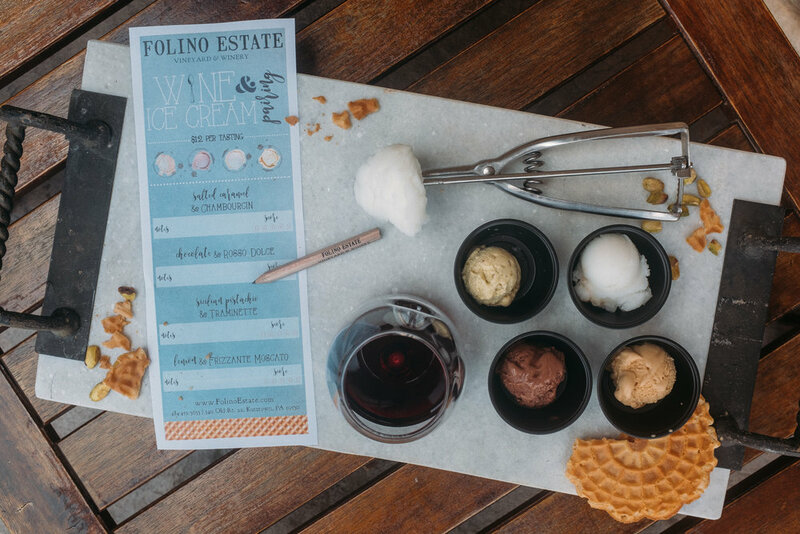 These pairings allow you to pair your favorite snacks, meals, desserts, and more with appropriately selected Folino Estate wines. During these tastings, our Wine Educators will inform you on their pairing decisions, and help you plan your own pairings for dinner events, dates, parties, and more to REALLY impress your guests! Can’t join us for soup and wine? Grab your hunny or gal pals and join us for our Valentine Wine and Chocolate Pairing weekend February 9 & 10. Enjoy 4 locally-made chocolates paired with 4 Folino Estate Signature wines for $15. Stay up to date for more information on this pairing coming soon on our Facebook page and website!